How do you tell your kids that they see greenery all around them, and not green when they are walking in a park? We’ve made it easy for you. 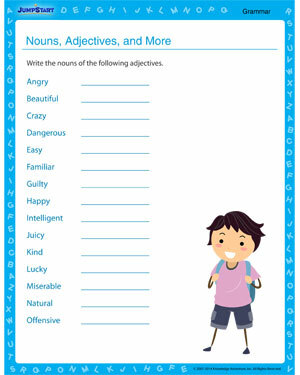 Here is a grammar worksheet that has a number of adjectives that need to be converted into their noun counterparts. The more kids practice noun-adjectives-noun exercises, the more they’ll strengthen their English speaking and writing skills.